Repeat after me: What I’m waiting to have isn’t as important as what I already have. This post may contain affiliate links to some TERRIfic sites you should check out. Learn more about it here. Is it me or is it really hard to come up with things to do when you’ve committed to not spending any money? And if you are doing a month long, no spend challenge – forget it. It can totally feel like torture. Then when you do find something to do, it turns out it’s really not free at all. I mean is anything truly free these days? Whether it’s not having gas, or needing batteries, things that are meant to be free end up costing money. And so the struggle of finding things to do during a no spend challenge begins. If you remember my post a while back, I’ve decided to kick the no spend challenge to the curb because it hindered me more than it helped me. You can read more about it here. However, I recognize that it is beneficial for some people. That’s why I want to help you all survive it. Not sure what the no spend challenge is? It’s when you commit to not spending any money on anything but necessities for a designated amount of time. It can be a week, a month etc. Regardless, the whole point is to limit spending for your desired duration to help you reach particular goals. Those goals could be to save more money in an emergency account, pay off more debt or even have more money available for a trip later in the year. Regardless of the reason, I’ve heard many people struggle with actually completing the no spend challenge. Normally, it’s because they’re going about it the wrong way. They are treating it like punishment. Not sure what to do during a No Spend challenge? The key to survival is focusing on things you do have instead of the things you can’t buy. I’ve realized the key to really surviving any no spend challenge is focusing on what you do have instead of what you don’t. Other wise it’s just cruel punishment and deprivation. Most people spend the entire challenge dreaming about when they can buy the desired item, feel deprived and then breaking the challenge to go buy said item. While the no spend challenge is meant to keep more money in your pocket by not buying anything, I like to think of it as getting creative with all you already have. Chances are you already have all you need to enjoy yourself and live happily. You just need to revisit those items to find the magic in them again. 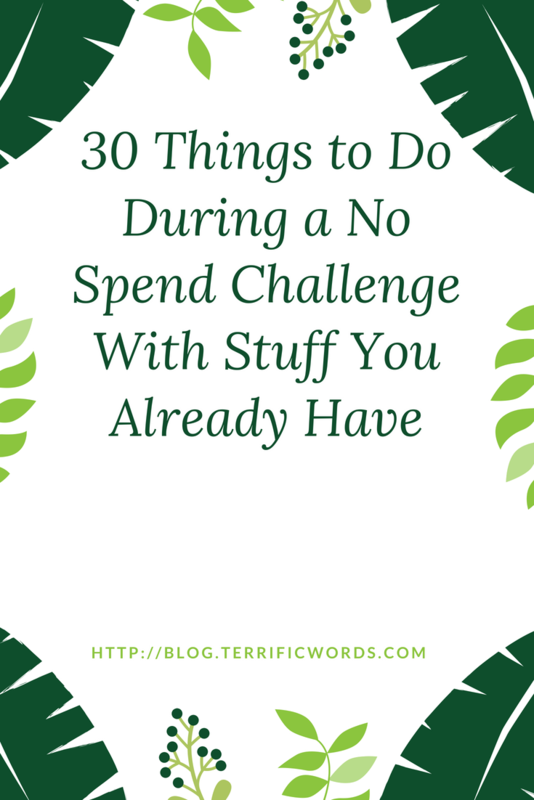 I’ve come up with 30 totally free things to do during the no spend challenge that will actually have you loving your life more instead of hating it and wishing you had just had more money. In creating this list, I tried to focus on the items most people already seem to have access too. I hate it when people suggest things like go to a drive-in movie theater to enjoy summer when the closet drive-in theater to me is in two and a half hours away. Or what about those no-spend challenges suggestions that list play with your kids’ playstation meanwhile I don’t own a $400 video game console. So here are 30 free things to do with stuff your probably already have during the challenge. 9. start making plans for the next upcoming event – birthday, shower, etc. What things do you do when you are trying limit spending? Have you tried the no spend challenge? What is your favorite free activitiy to do. Totally saving this list for when I’m tempted to go out and shop (which is a lot). Thanks for compiling this! Planning a vacation actually keeps my spending in check. It convinces me that if I buy that thing I don’t need now, I get farther from my goal. I think meeting challenges, including a no-spend challenge is first of all a state-of-mind thing. As you said – applying your focus of what you do have, rather than what you don’t have. This is a really great list of practical things that are fun and real for most of us. Such great advice, tips and ideas. These are great activities to get your mind off of spending money!